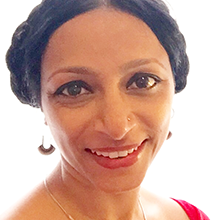 Mili John Tharakan loves all things textile and has been practicing in the field of e-textiles for the last 10 years. Her interest lies in ‘NeoCraft,’ the merging of electronics with traditional textile craft, creating textile technologies that are also electronic gadgets in their own right. She considers herself a global nomad, and seeks creativity and innovation at the cross-roads of cultures and disciplines. For her Masters in Textiles from Manchester Metropolitan University, Mili researched integrating fibre optics with traditional textiles. Later she joined the Mixed Reality Lab at the National University of Singapore as a Research Associate where she explored, among other ideas, non-emissive textile animation with Peltier-controlled thermochromic inks. At the Smart Textiles Design Lab at the Swedish School of Textiles, Mili researched ways to merge traditional textile craft techniques of the Nordic Sami community with e-textile principles to create new expressions and experiences. In 2014, Mili set up TILT, Welspun’s Smart Textiles Division, where she is developing Smart Home Textiles for the retail market with a focus on developing e-textiles solutions for the home. Her particular interest lies in understanding and resolving the challenges of scaling e-textiles for mass production.